Thankfully I chose the weekend of the Bournemouth game to travel to the Turks & Caicos for a week’s diving. Although I made the mistake of listening to the game, which was not a good start to the holiday. But it has to be said that, despite the recent poor run of results, this seemed to be the first bad performance of the season and it was good that the lads had the international break to give them time to recover. Since Watford’s downturn started after Javi won the Manager of the Month award, I was hoping that the curse would now transfer to Nuno. A trip to Molineux evoked awful memories of our last visit which ended with one of our regular travelling fans, Nic Cruwys, fighting for his life following an attack after the game. Having previously witnessed an attack on the Watford fans’ coaches (which are generally used by families and the elderly), I was not looking forward to this trip. Our party decided to delay our arrival by meeting in our pre-match pub of choice in Birmingham instead. When I arrived early doors, Graham was already in place, but the pub was otherwise almost empty. Then, suddenly, there was an invasion of Morris Dancers. The bells were driving me crazy. Having thought we had found a quiet spot, the rest of our party arrived to find a dance taking place in front of our table. I couldn’t help reflecting on the irony that the two Morris dancers in our usual away crowd had decided to give this game a miss. We left Birmingham in plenty of time to make the journey to Wolverhampton. On arrival at the station, we were met by a phalanx of police who directed us behind the station and on a rather circuitous route as they didn’t want Watford fans walking through the city centre. I must say that the route that we took seemed a little too out of the way for my liking, but there were police officers stationed at various points on the way and we arrived at the ground with no sign of any trouble. Team news was that, in addition to the suspensions of Kabasele and Holebas, Deeney had picked up a minor injury and Gracia had decided to drop Gray to the bench, the replacements being Mariappa (who also captained the team), Masina, Deulofeu and Success. So the starting line-up was Foster; Femenía, Cathcart. Mariappa, Masina; Deulofeu, Hughes, Capoue, Doucouré, Pereyra; Success. Wolves were unchanged for the ninth game this season. 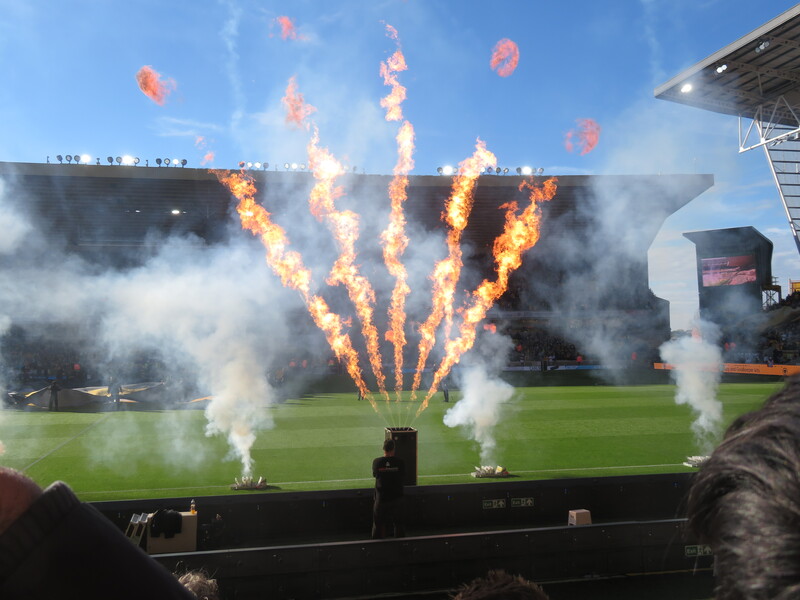 As the teams came out prior to kick-off, there were some very impressive pyrotechnics. Our pitch side seats meant there was a danger of scorching, my eyebrows may never recover. When it was over, we couldn’t see the pitch for the smoke. It seems that Wolves subscribe to the adage “no pyro, no party”. As well as the overheating prior to kick-off, the stand had no leg room (I am 5ft6in and could not sit comfortably, even if the people in front had allowed me to do so) and was also bathed in bright sunlight, which made it incredibly difficult to watch the game. The first half chance of the match came as a free-kick from Neves was headed over by Masina. The resultant corner was met with a looping header from Bennett that was pushed over the bar by Foster. The second corner led to a quick break by the Hornets as Femenía hared upfield before finding Deulofeu whose cross was straight into the arms of the Wolves keeper, Patricio. After an even start that had been short on chances, Watford took the lead on 20 minutes. 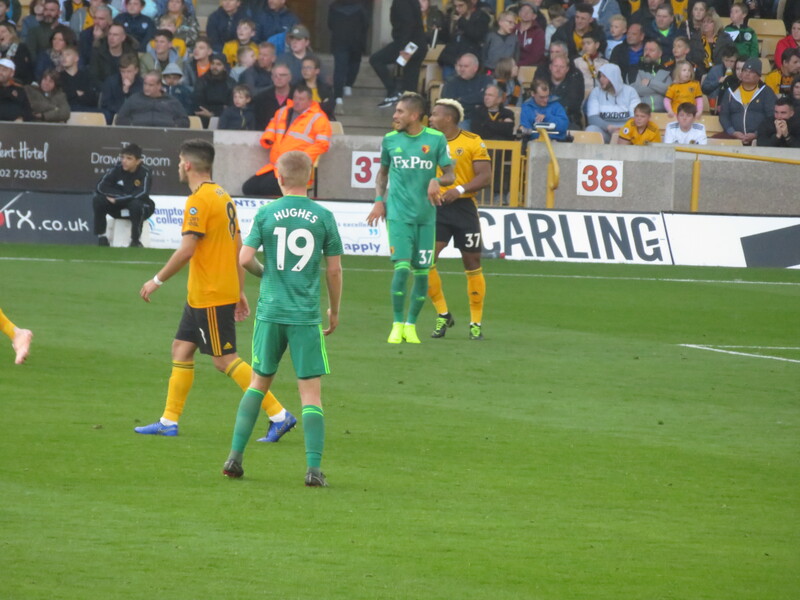 The move started with some really good work from Deulofeu before Doucouré played the ball out to Capoue who blasted a low shot from distance into the Wolves net. There was a momentary delay before the celebration as we couldn’t quite believe what we had seen. It was a terrific strike. We had hardly stopped bouncing when the second goal went in. Straight from the restart, the ball found its way to Pereyra on the left from where he effortlessly curled a shot over the keeper and into the opposite corner. Well, that was unexpected! Wolves seemed a bit shell shocked at that point and the next Watford attack finished with Success being taken out. The travelling Hornets were shouting for a penalty, but the referee indicated that the foul had been committed outside the area. It was in a dangerous position, but Deulofeu’s free-kick was disappointingly straight into the wall. The first booking of the game went to Neves after a foul on Hughes. Watford continued to dominate and some lovely passing around the Wolves box finished with Doucouré playing the ball back to Pereyra who curled his shot over the bar. There was a rare attack from the home side as Jiménez broke forward and got into a dangerous position, but his shot was poor and flew wide of the far post. After another lovely passing move involving Femenía and Hughes, the ball reached Doucouré whose shot was saved by Patricio dropping low to gather. The half time whistle went with the Hornets two goals ahead and in total control of the game. It had been an impressive half of football from the visitors. The two goals in quick succession had shocked the home side, but it had been a performance of assurance and skill. Wolves made a substitution at the restart bringing Vinagre on for Jonny. Watford started the half well as Success latched on to a through ball and surged forward, but his shot was wide of the target. There was an early chance for the home side as Vinagre tried a shot, but Foster was down to block and the ball was cleared. Foster was taking his time to restart the game, which enraged the Wolves fans behind the goal who were already on his case for his West Brom connections. Ben couldn’t have cared less. Nuno made a second substitution on the hour mark bringing Cavaleiro on for Jiménez. 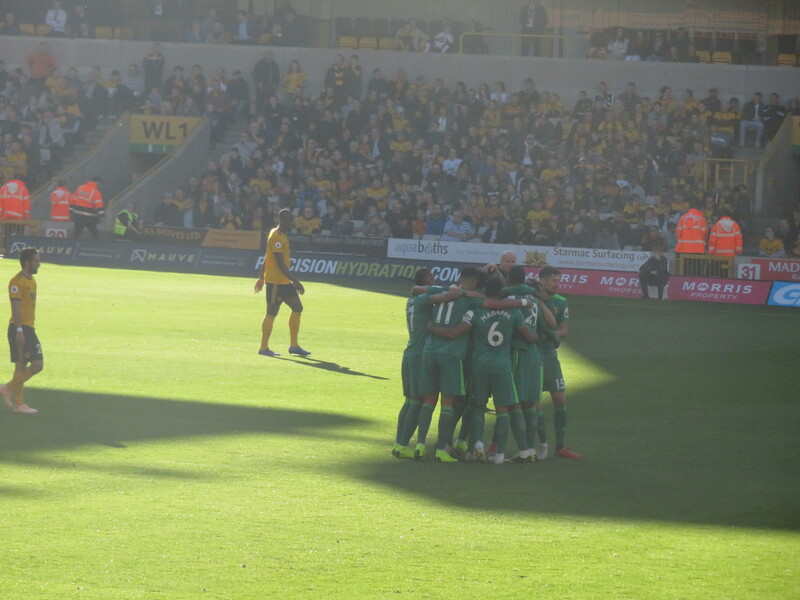 Wolves had a half chance as, from a Moutinho free kick, Boly tried a backheel in the direction of the goal, but Foster was able to make the save. Watford made a rare second half break as Success found Doucouré whose shot was blocked. Hughes was the first Watford player to be cautioned after he pulled back Vinagre as he tried to escape upfield. Gracia’s first substitution saw Gray coming on for Deulofeu, who had run the first half, but had faded since the break. Wolves continued their attempts to break back as Moutinho tried a shot from distance that flew over the bar. The home side then made their last change bringing Traore on for Doherty. Gracia’s next substitution was a defensive one as Prödl replaced Success. At about this time, with 15 minutes to go, the sun disappeared behind the stand and I could finally see the game without having to shield my eyes or being blinded by the glare from my glasses. Wolves were getting closer to reducing the deficit as a cross from Vinagre was headed just over by Cavaleiro. It felt as though the Watford goal was leading a charmed life at this point, but the home side were incredibly wasteful as another free kick from a dangerous position was launched high and wide by Neves. Watford were still making occasional attempts to increase their lead, on this occasion a shot from Gray was blocked, so Hughes tried to score with a tackle, but Patricio was able to gather. With the clock running down, the next chance for Wolves to get something from the game fell to Costa who again directed his shot over the bar. Prödl’s appearance was short lived as he left the field limping and was replaced by Wilmot who was making his Premier League debut. Wolves had one last chance from a free-kick which was met by a glancing header that flew wide. The fourth official indicated four additional minutes, but they were painless for the Hornets who finished the game as deserved winners. The post-match celebrations were very enjoyable. 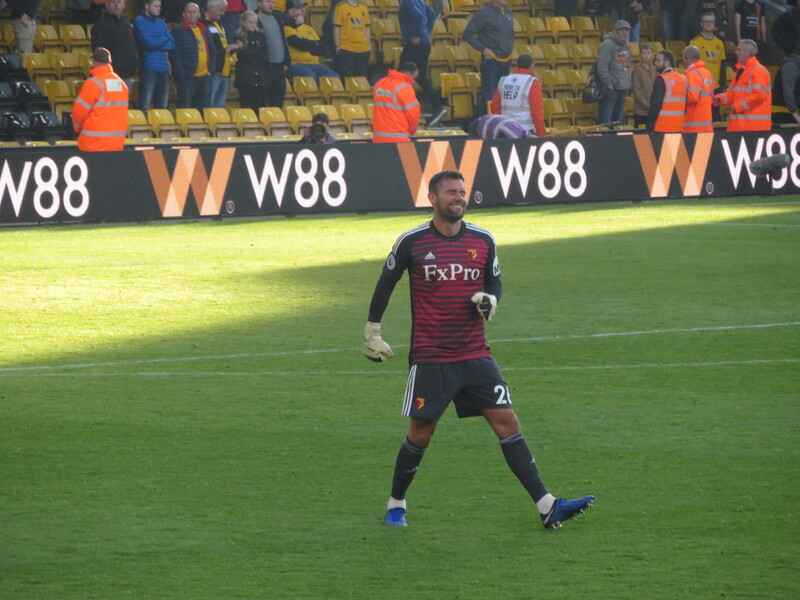 Clearly Ben Foster, who had been the target for dog’s abuse for most of the game, was delighted. His fist pumping was almost Gomes-esque! It was also lovely to see players coming over to the fans to present them with shirts, the first being Deulofeu who jumped the barriers to hand his shirt to a fan. But I must admit that the one that got to me was when Aidy Mariappa came over to Flora, one of our wheelchair fans. Aidy also jumped the barriers to reach Flora to hand her his shirt and have a chat with a beaming smile on his face. I had to wipe away a tear. Before the game, the Watford fans I spoke to had all been of the opinion that a point would have been a good result, but nobody seemed at all confident of that outcome. 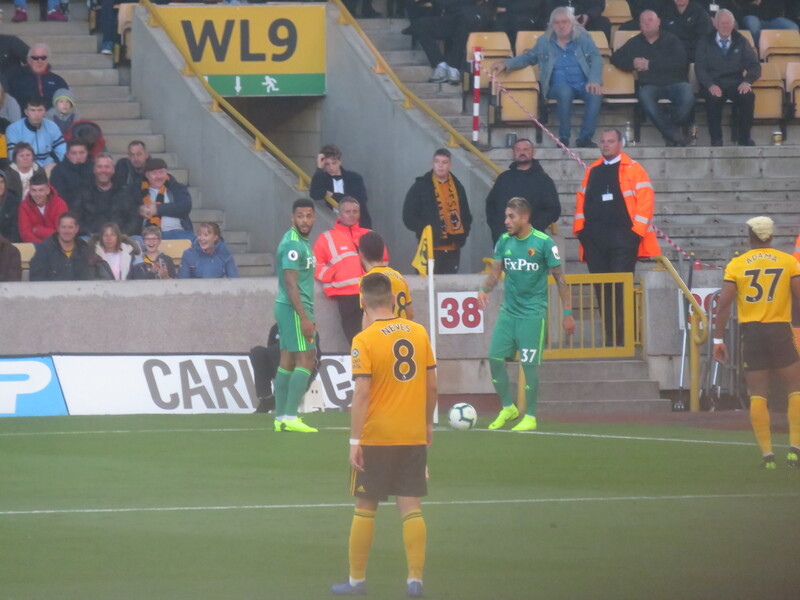 That two goal first half minute decided the game but, despite the rearguard effort in the second half, Watford were in control for the full ninety minutes and Wolves never looked like getting back in the game. As good at the forward play was in the first half, and there were some absolutely gorgeous moves, the defensive performance in the second half was equally good, with some brilliantly timed tackling and a general sense that Wolves had nowhere to go meaning that they were reduced to long range efforts and set pieces. Deulofeu’s first start of the season was excellent, it was lovely to see him back. But the highlight for me was the fact that, although Capoue and Pereyra will be lauded for their goals, they both put in a shift at the back as well. It was a real team effort. After the wobble in recent weeks, that was certainly a performance to put smiles back on the faces of Hornets fans and to give us renewed confidence for the rest of the season. Football is fun again. This entry was posted in Watford FC and tagged Abdoulaye Doucoure, Adam Masina, Adama Traore, Adrian Mariappa, Andre Gray, Ben Foster, Ben Wilmot, Conor Coady, Craig Cathcart, Diogo Jota, Etienne Capoue, Gerard Deulofeu, Helder Costa, Isaac Success, Ivan Cavaleiro, Javi Gracia, Joao Moutinho, Jonathan Castro Otto, Jonny, Kiko Femenia, Matt Doherty, Nuno Espirito Santo, Raul Jimenez, Roberto Pereyra, Ruben Neves, Ruben Vinagre, Rui Patricio, Ryan Bennett, Sebastian Prodl, Watford FC, Will Hughes, Willy Boly, Wolverhampton Wanderers FC on October 22, 2018 by franelynn. Again Frances, many many thanks for a super write up for an absent fan.